Giving our customers more choice, Recharging NSW now accepts American Express. So we have our new e-commerce section of the website all set up, with our charging station cables. We are shipping to Australia and New Zealand. Head over to our cable shop for a Australia Day long weekend special use coupon code “aussie5” for a 5% discount valid until Monday 30th of January. So there are two events; the conference where we are presenting Friday morning. and Saturday the expo (free entry). Which we’ll have a stall at so come down and talk Electric Vehicles. Thanks to all those who visited us at the exhibition. We had a wonderful time telling people about the advantages and benefits of electric vehicles. Apologies to those who wanted data sheets and brochures we under estimated the need below are some quick links to that information. Come visit us at stand 207, at the Australian Energy Storage Exhibition June 3-4, Australian Technology park, Sydney. We’ve reduced the price on the Elektrobay 250 from $1,870 to $1,760. The difference between the 2 Models is the PLC (power-line communication) function. For vehicles which have this feature it allows the vehicle to potentially gain internet access through the charging station if there is a lack of mobile phone reception. Currently only the Smart ED (not available in Australia) has this feature. This enables us to reduce the price to $2,090.00. 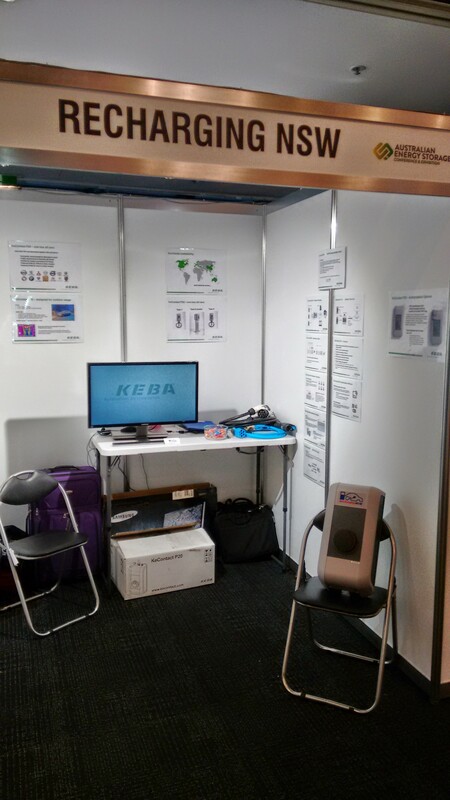 Recharging NSW is proud to announce that it is now a retailer of Keba KeContact P20 charging points and electric vehicle supply equipment (EVSE). Which e-vehicles will be able to be recharged ? 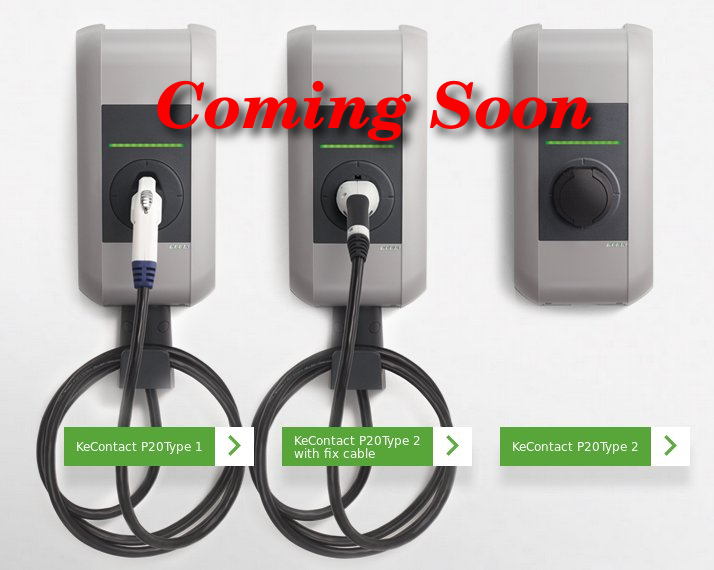 KeContact comes in 3 variations Type 1 J1772 (cable), Type 2 Mennekes (cable) and Type 2 Mennekes socket. All of the above with either a Type 2 to Type 1 cable or a Type 2 to Type 2 cable. This is the universal option best for when you want to be able to support as many cars as possible with a single unit. Where can I find a KeContact P20 ? Recharging NSW wishes everyone a happy holiday season. During the holiday season. Email responses may take longer. And shipment may be delayed. We will be back to normal after 18th of January. There is plenty of exciting news for 2015. Introducing our 7kW Aerovironment and Elektrobay EVSE. If you head over to our product page, you’ll find the first in a hopefully expanding selection of Electric Vehicle Supply Equipment (EVSE). So time for a quick Question and Answer session. Why do I need a 7kW EVSE ? Convenience: Unpacking and packing up the supplied charging cable can get tiresome. Drivers have found it more convenient to park and plug in from a fixed installation. Efficiency: There are saving just from the car charging system being on for less time. Some cars will also benefit from being able to operate at full power when recharging. Safety: a properly installed hard wired EVSE is safer than using a power point and cable. What Electric Vehicles (EVs) and plug in hybrids will they work with ? How fast will a 7kW EVSE recharge my car ? *for simplicity this doesn’t take into account inefficiency in the charger. We can see from table that the BMW i3 get the biggest benefit from the upgrade; if it takes 8 hours from a powerpoint then using our 7kW EVSE should decrease it to (8 hours times the “charging time decrease factor” i.e 8*0.34 ) 2.72 hours. What is the difference between the two models ? Aerovironment EVSE-RS is cheaper, has a longer cable which will be more convenient, and better suited for an outdoor installation because of the heat rating to 50°C. Elektrobay is slightly more expensive but has a key lock to stop unauthorised use, which may be of use in less private parking spaces. It also has a remote start circuit, this allows you to increase the intelligence of the EVSE. You can for example; wire in timers, remote start switches, create coin operated charging stations or start charging when you solar system starts exporting energy to maximise your renewable energy use. If you want to explore any of these ideas recharging NSW is happy to help. I have more questions ? Fill out the form on the contact us page.